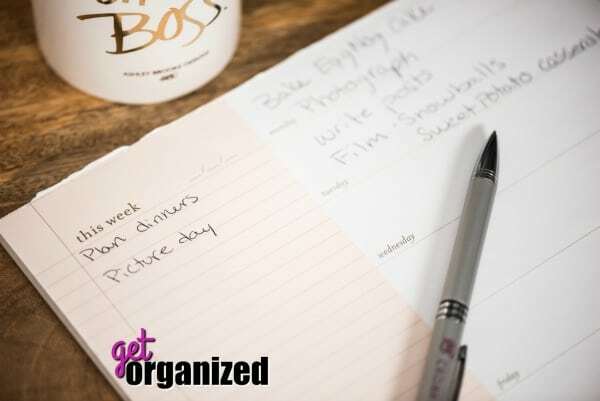 These 5 Tips to Keep You Going This Holiday Season will make this time of year so much more enjoyable and stress free! This post is sponsored by The Laughing Cow but as always all opinions are my own. The holiday season is here and even though it’s the most wonderful time of the year it can also be the most stessfull/busy time of the year so I wanted to share my 5 tips to keep you going this holiday season. For me the Christmas season has always been the best! I love holidays in general but there is so much magic to Christmas that I LOVE it! My husband wasn’t as big of a fan but I’ve slow worn him down so now I get calls asking if we need even MORE Christmas decorations! What a good man! I love it but it’s also my most busy time of year. I have two little guys and it’s so important for me to make sure that I’m experiencing the Christmas season with them. I want them to have the same feeling of magic that I do this time of year but I don’t go overboard. 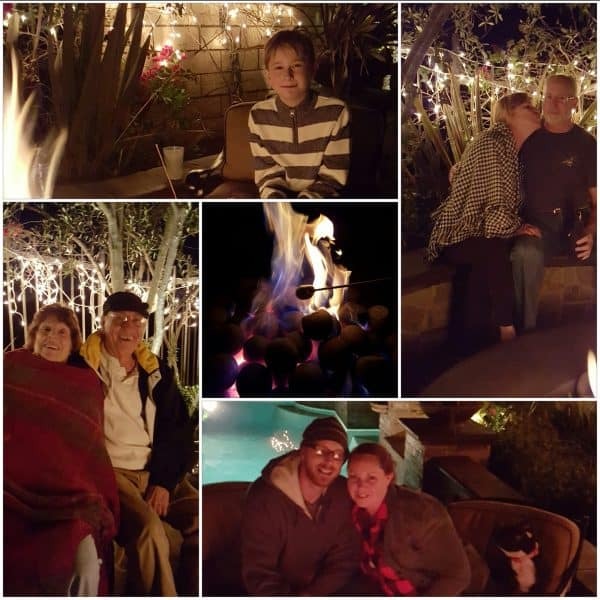 It doesn’t take much more than spending time together doing something Christmas to make it magical. We have a tradition of watching a Christmas special every night. There are so many great shows from when I was little or even my parents that I get to share with them. For a food blogger the holidays are bonkers!!! This is our championship game! There is so much to finish and get out and share that it’s hard to stop sometimes. I usually get more requests for my work this time of year too. So I have to balance my editorial calendar with my day to day business and I have to have strategies in place to make sure that I have the energy and brain function to deliver! So I’ve been putting my game plan together and talking about it all with my husband and decided to share my 5 tips to keep you going this holiday season with you guys today! This doesn’t come naturally for me! I love organization and get excited about it. That’s why I loved the first day of school growing up. I had all new supplies and tools to get me organized. The problem was that I very rarely kept it up. Now that I’m an adult I have MULTIPLE ways to keep myself organized. I’ve got a spreadsheets for work, spreadsheets for home, paper lists, lists on my phone, online calendars and paper calendars!!! I have to have back ups to my back up! I’m a list maker. I feel like if I don’t write it down it stays open in my brain. I can’t turn it off until it’s been written. It feels like closing a tab on the computer. My mind is seriously a bajillion open tabs and when they’re all open I can’t process as fast, just like my computer and I start to make mistakes. Plus, it makes going to sleep soooo hard! This time of year you have so much to remember to do that it’s best to write a list, put it in your calendar and then move on. I like to write things down because just that simple act will increase my chances of remembering! Get a fun cute calendar that you want to look at and stationary that you love so you’ll want to keep up with it but make sure it’s in a place where you’ll see it. That’s why I also have my online copies! Plus, it feels twice as good to cross something off of your list twice! I struggle with exercise. I love the way I feel after I workout. I also love sitting on my couch in the morning, after the kids are off to school, drinking my tea and watching the shows I didn’t get to watch the night before. When I don’t workout I absolutely notice a drop in my energy the during of the day though. 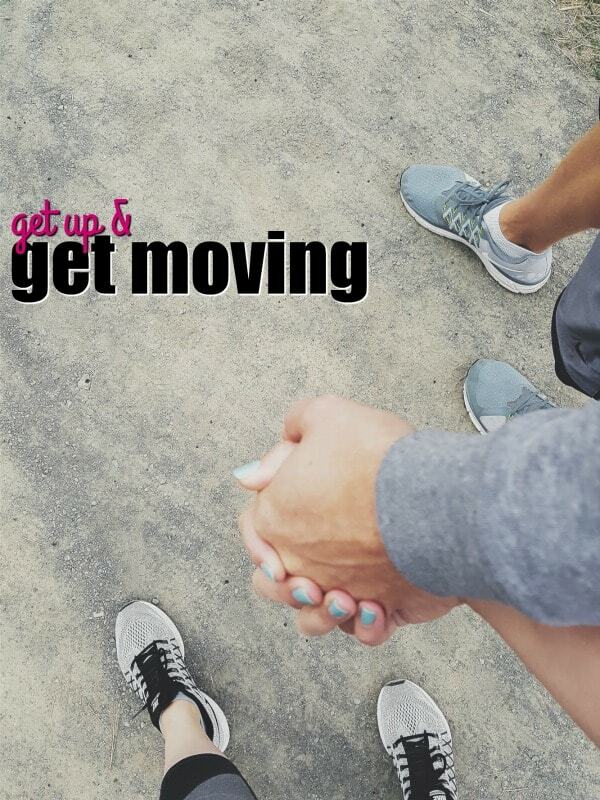 Getting up and moving gets me ready for everything I have to get done. I get started with all my work at a running pace instead of a crawl from the couch. I also need to get my blood pumping so that I can clear my head. Remember all those tabs and lists I told you about? Those will wear me down if I don’t workout and start fresh. It’s like a reboot for my brain! I think it takes a lot of patience to be a parent especially this time of year and being able to start fresh helps me with that. When my guys were littler it was like the pressure of being good for Santa was too much and they just went full force into naughty. Not really, they’re good kids that would get overwhelmed just like me at the holidays. Having snacks on hand is soooo important for me! I will usually get busy and forget to eat until I’m way past hungry and in full on hangry territory! If I can’t find a good snack option that’s fast and easy I will lose my mind and dive right into the Santa shaped cookie jar filled with every sugary treat! This time of year i have more sugar in the house than normal. We have cookies, candy and fudge all over the kitchen! That’s great as a small treat but if I wait too long to eat and can’t find an easy snack I will always binge on sugar and then crash and get nothing done for the day. 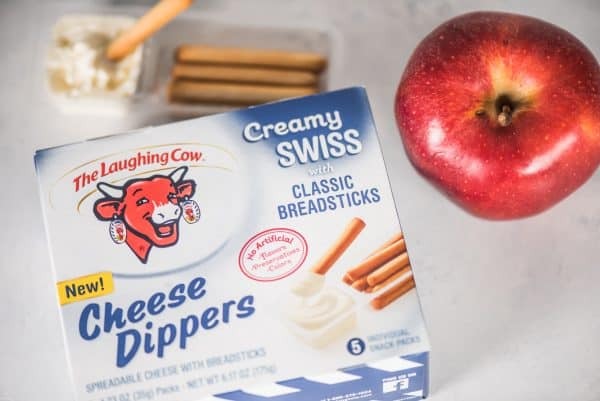 For me I love having Cheese Dippers by The Laughing Cow® on hand! 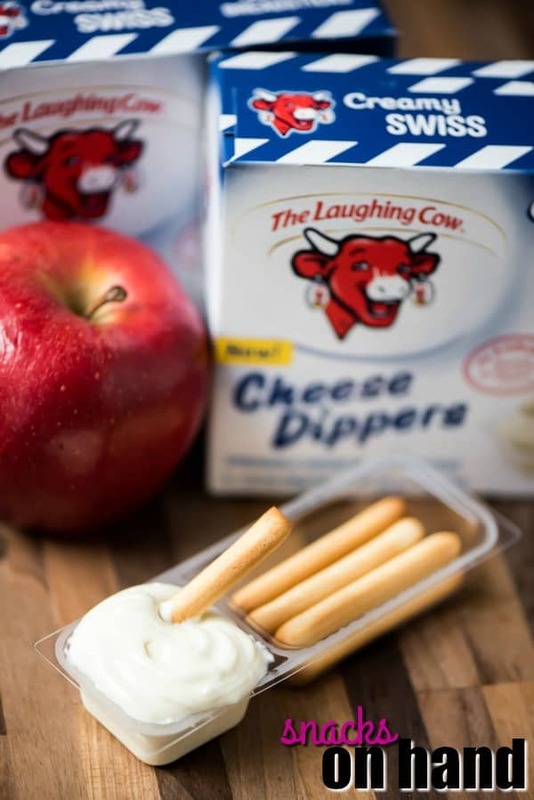 I’ve always had The Laughing Cow cheese in my fridge but I like that these little dippers are a complete snack! I don’t have to prep or think! I can open and dip right away. They make great snacks for the kids too! Both my kids take a snack to school and this works great. I love that I get 4 grams of protein too! That helps to keep me fuller longer and out of the cookie jar. When I’m busy they also make a great snack to throw in my purse. My husband and I recently flew to Wisconsin and I brought a couple Cheese Dippers to snack on during the flight! The 5-pack box only cost $4.99 so that beat the $9.00 cheese box on the flight!! This is huge! 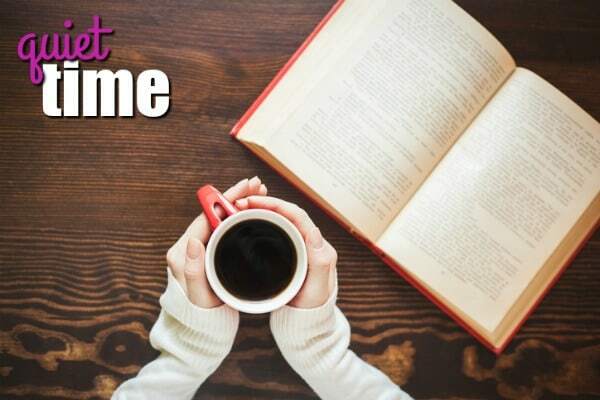 It can be hard for me to wind down at night so having quiet time to myself to read or meditate is super important. It helps me to shut down my brain so I can turn off the list of gifts I need to get and wrap off and turn sleep on. I love to read but I have too much to do during the day. I read at night in bed because I will always end up falling asleep. That time to have the quiet with the t.v. off and the phone off and Facebook put away is amazing! It’s my favorite and I feel the noise in my head shutting down. If you’re not a big reader (I think you just haven’t found the right book) then try meditation. Find quiet time and be still. There are a ton of apps you can download with guided meditations you can do to help. It’s a great way to practice turning your brain off. Plus, if you get to a point where you can turn it all off then you’ll be able to turn the focus back on when you want to too! I think a big key to happiness is learning to control your thoughts! This is good for moms, dads and kids! Everyone needs rest. Quiet time leads straight into this. We get dark early in Portland during the winter so I can get my kids to bed during the week pretty good but as soon as they’re out for winter break bedtime gets later and later! It really important for me to get them in bed at their regular hours so that they’re getting the rest they need and not melting down in the middle of an over crowded store while I try to do last minute shopping! Trust me on this. It’s just as important for me to get my rest in as well! I have no shame! When I’m tired I can throw and adult tantrum like the best of them! Especially if I’m fighting for a parking spot a mile away from the store, so that I can go shopping in a store filled with too many people, for a toy everyone wants this year. 🙂 Sleep helps me put everything in perspective, have the energy to get off of the couch and workout, not eat all the sugar in the house and focus on what I need to do. All that so I can enjoy doing the things that make me happy! This time of year is amazing so set yourself up to enjoy it without all the stress and worry! 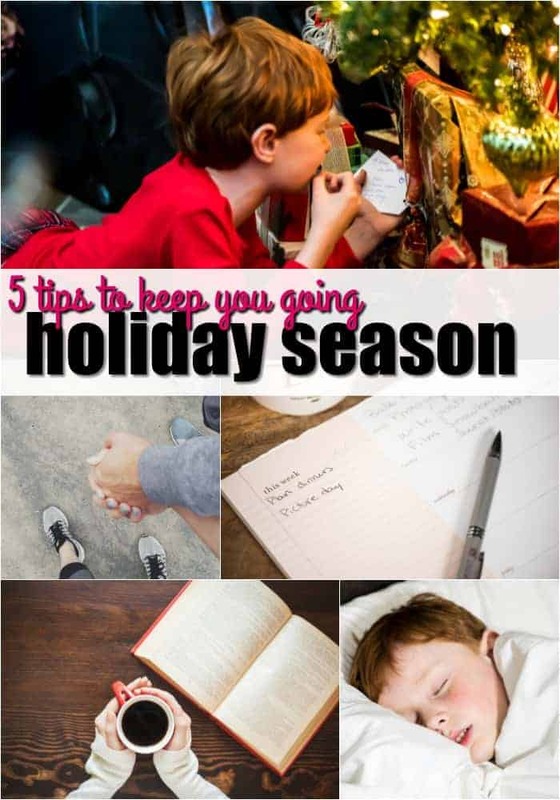 These are just simple 5 tips to Keep you Going this Holiday Season! Did I leave anything off? What do you do to keep your head above water and enjoy the season?